What pretty ladies in this photo. 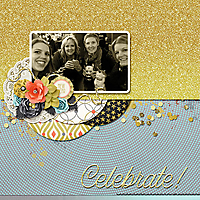 Love the gray polka dot paper, paired with the gold it really plays so well with your photo. Great use of open space. Pretty clusters and the tag is so appropriate.